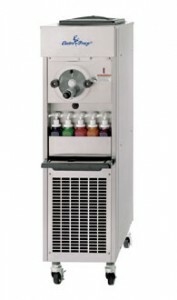 This is the highest volume slush/cocktail freezer available! Fast, easy, portion-controlled, labor saving frozen beverages from a machine that will last! Syrup racking with 5 bottles provides flavor options while running a neutral or core base flavor. Perfect for QSRs, beach resorts, arenas and large sports venues.